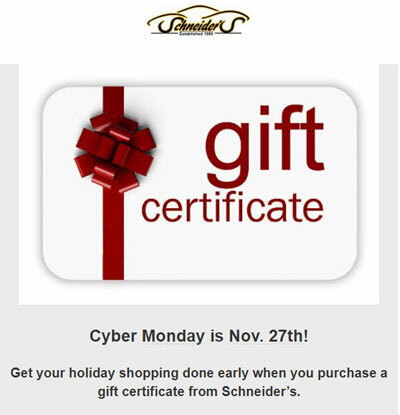 Get your holiday shopping done early when you purchase a gift certificate from Schneider’s! Keep your loved ones safe and give a gift of peace of mind for the holidays. Receive 10% off your gift certificate purchase when you use promo code gift10off. Call us or email us at [email protected] to purchase your gift certificate today! Gift certificates are not valid until payment has been received and successfully processed by SCHNEIDER’S AUTOMOTIVE REPAIR. SCHNEIDER’S AUTOMOTIVE REPAIR reserves the right to refuse service or reverse any gift certificate purchase for any reason and return the funds to the purchaser. SCHNEIDER’S AUTOMOTIVE REPAIR reserves the right to immediately invalidate gift certificates, without notice, should it receive a credit card chargeback, returned check or other form of repudiated payment made towards the gift certificate. SCHNEIDER’S AUTOMOTIVE REPAIR is not responsible for lost or stolen gift certificates. SCHNEIDER’S AUTOMOTIVE REPAIR reserves the right to dishonor the gift certificate, if it reasonably believes it was not validly purchased, has already been redeemed, or the redeemer stole or is otherwise not the intended beneficiary of the purchaser. SCHNEIDER’S AUTOMOTIVE REPAIR reserves the right to change these Terms and Conditions from time to time in its sole discretion. SCHNEIDER’S AUTOMOTIVE REPAIR is not responsible for emailed gift certificates that do not reach their intended recipient for reasons beyond its control. Bounced email is not monitored. Receipt of email cannot be verified. SCHNEIDER’S AUTOMOTIVE REPAIR MAKES NO WARRANTIES, EXPRESS OR IMPLIED, WITH RESPECT TO GIFT CERTIFICATES.